Bathroom was newly done up and nice shower. Good price and staff friendly. Nicely situated with green gardens surrounding. Lovely venue, close to amenities, friendly and helpful staff. lovely setting for evening walk. Food was excellent hot fresh and well presented. Value for money!! Very decent breakfast in nice room. Bar was pleasant and staff all seemed friendly and keen to help. I have been a few times and have always enjoyed the chill out time and the gym,pool,steam room. I have stayed before it's always clean and comfortable. Great bed, really good nights sleep. At breakfast they were flexible with charges as I only wanted coffee and toast. Helpful staff. Breakfast was good. Good location. Nice communal areas. 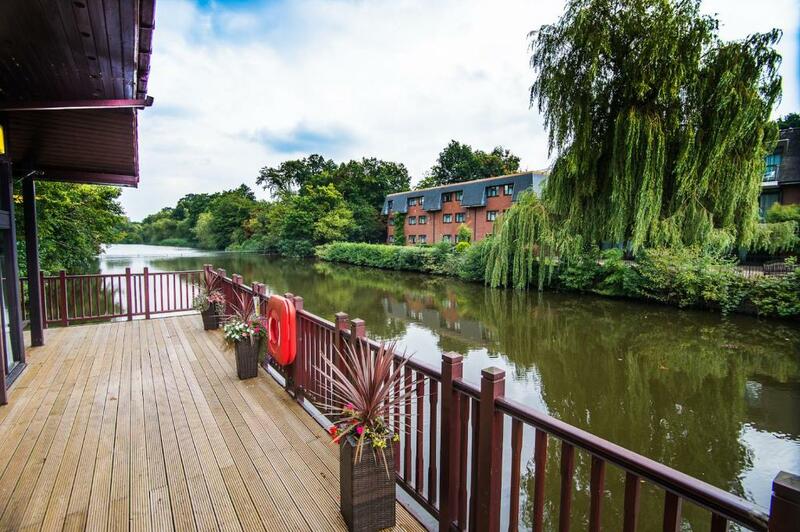 Ramada Birmingham/Sutton Coldfield This rating is a reflection of how the property compares to the industry standard when it comes to price, facilities and services available. It's based on a self-evaluation by the property. Use this rating to help choose your stay! 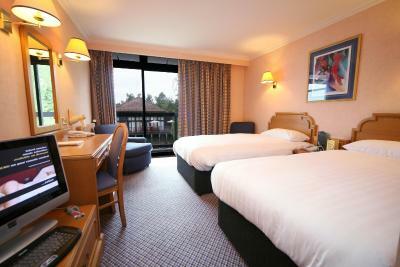 Located in Walmley, Sutton Coldfield, the hotel is about 8.1 mi northeast of Birmingham city center. The Ramada has easy access to the M42 and the M6 toll road and is well located for the NEC, and the International Convention Center. The on-site health club includes an indoor pool, a relaxing sauna, as well as a steam room and spa bath. Guests can exercise with a game on the squash courts, and work out with a gym, dance and aerobics classes available. A beautician and hairdresser are also available. Guests can relax in The Club Bar or enjoy a meal prepared from fresh local ingredients in the Club Room Restaurant. Birmingham's center is less than 15 minutes' drive away, and many attractions are nearby: Cadbury World, the Seaworld Center, Warwick Castle and the Snow Dome at Tamworth. When would you like to stay at Ramada Birmingham/Sutton Coldfield? This double room features a cable TV and tea/coffee maker. This family room has a cable TV and sofa. 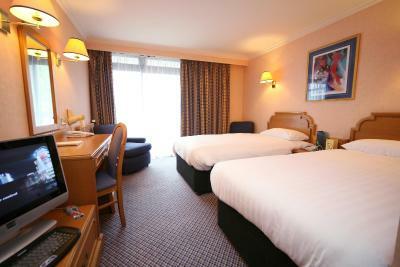 This triple room features air conditioning and tea/coffee maker. House Rules Ramada Birmingham/Sutton Coldfield takes special requests – add in the next step! Ramada Birmingham&#47;Sutton Coldfield accepts these cards and reserves the right to temporarily hold an amount prior to arrival. Ramada Birmingham/Sutton Coldfield accepts these cards and reserves the right to temporarily hold an amount prior to arrival. Please note that The Club Room Restaurant will be closed on Friday and Saturday nights during December due to festivities. Please note during the festive season the property will be hosting a number of Christmas parties until late, please alert staff when booking if you require a quieter room, although this cannot be confirmed. A full menu will be available until 19:00. Please contact hotel using the details on your booking confirmation for more details. Limited dining between Christmas and New Year. Leisure Club timings may vary. Guests paying in cash, a security deposit of GBP 50 will be required on arrival. The room itself was really tired, basic, and didn't feel like a proper hotel - more like a pokey flat. We were originally put in an even worse room, which was one bed short, though it was sorted out reasonably quickly. There was no fridge and both the kids' beds (bearing in mind this was a family room, apparently) were fold-out sofa beds and not particularly stable. Not great value for money. Breakfast was good, and the staff were super friendly. The leisure facilities - pool, sauna, steam room - were good and well-maintained. Adjacent bathroom (I stayed in 221) gave prolonged whistling noise if water was used. This was the main issue. Would ask for another room next time. Breakfast good. Location with parking excellent. Courteous and helpful staff. Scania, the lady at the front desk was amazing in problem solving. Loud sounds from the radiator system which did not allow us to sleep, very uncomfortable bed, dated deco and the service from the lady who checked us in and also checked us out. The lady who checked us in clearly knew I was pregnant and even asked how far I am - despite this she gave us a room outside of the hotel and quite a bit of a walk to and from the facility and the hotel knowing we would be dining in the hotel. The room given was also opposite a building site/builders room. I spoke to Ashley (manager) who very kindly and very quickly arranged us a room within the hotel which made it easier for us to access the amenities, health club and restaurants. The room given was of a good size, however the room telephone did not work, the bed was very uncomfortable, deco was very dated and the only time we noticed the main downfalls of it was when we tried to sleep, there was a terrible loud sound in the radiating system (we believe, could possibly be a generator) which lasted half an hour and was occurring every 15 mnts. A complaint was made on the second night and a person visited the room and heard the sound and confirmed others had also complained. The next morning when checking out we raised our concerns of the loud sounds, uncomfortable bed, no sleep for two nights, no telephone which meant we had to keep calling from our mobile for room service every evening. The lady did not seem bothered and just apologised, I then asked to speak to a manager however no one was available and I then spoke to a lady called Sandra who was in the restaurant who confirmed she will look into our concerns. Only positive from this stay was the service received from Ashley and the food. We have stayed in many Ramada hotels which have been very good, when I raised this with Sandra we were told that the Hotel is privately owned and has nothing to do with Ramada, this hotel is bringing down the name of Ramada Hotels. Staff moved us to a new room on request with no fuss. Rooms in main building were better and pool was nice. Good location. Hotel is dated however has a good feel about it. Staff are friendly. Check in was hassle free and surprisingly we were upgraded to a executive room. Breakfast was good. Only grumbles were noisy people in the corridors near our room 101 at 12.30 am and 2.30am which awoke us both. Some guests are simply thoughtless in talking loudly when others are trying to sleep, but that, sadly, happens in many hotels and guest houses. Food good value and tasty - evening snack and breakfast next morning. Staff helpful in the restaurant and everything very comfortable. The room 219 is a family room . It was clean but needed up-dating . Needs a new sink as it was cracked . The room was based near a huge generator that banged and clicked all night and hardly slept . Informed the Receptionist when we checked out and they said they would “ look into it “ . Staff polite . Great choice at breakfast . the room was poor. We were situated outside of the main hotel, the room was dark & dreary, and not clean. Sofa & chair stained & dirty, bath was awful & had grime/mould marks. Bathroom had silverfish bugs crawling. Bed very uncomfortable and creaky. Tea and toast making facilities at breakfast. Extra comfy bed. Great shower , bathroom. Good view.